In my last post, we looked to the heavens, to see the beauty displayed there.Today,we come a little closer to earth, still in the sky, at least for some of the shots. I have loved birds for a very long time and still do.Sometimes they can be a challenge to photograph, but I keep on trying. The diminutive Black-capped Chickadee,may be one of the easiest to photograph, at least if you offer some food or water. 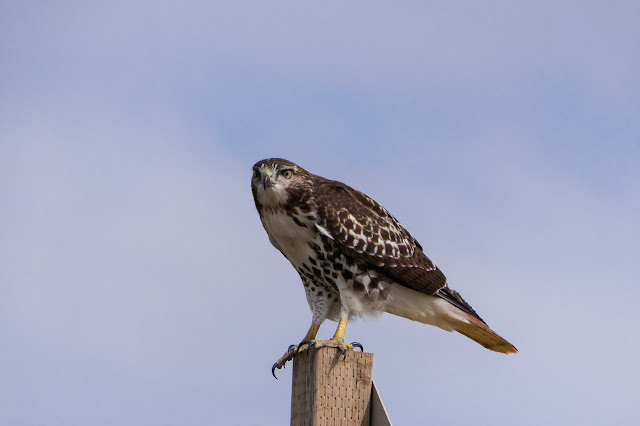 The Red-tailed Hawk,on the other hand is usually not very cooperative.Well,this bird proved that to be wrong.He/she was perched on a road sign, just at the edge of the road and I was stopped on the road, across from him. Many shots later,I left with the bird still remaining on it's perch. Same bird as the one above, slightly different editing. As the Ruby-throated Hummingbirds were preparing to head south, they came to the feeder regularly.This gave me many chances to get a picture.Of course,I would have loved to see an adult male with the ruby gorget/throat,but had to be content with this one. 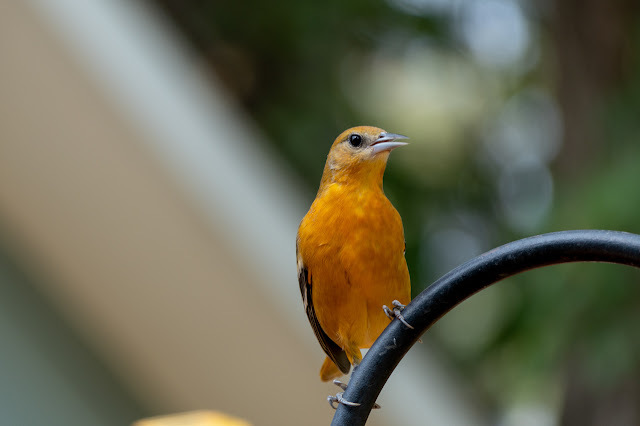 I had virtually no Baltimore Orioles in spring, but they sure loved the nectar feeder in early fall.Once again,I had many chances for photos. I will spare you the agony of scrolling through too many pictures and just share one. I’ve never found time spent amongst nature to be a waste of time. You can't bore me with bird pictures, or any others :) Post more and more of your great photography! Gods amazing beauty in our feathered friends...so very pretty. You are better than me at snapping birds. I find that even with feeding the tiny chickadees, they jump and start around so much, they are wired! So it is hard to snap them. 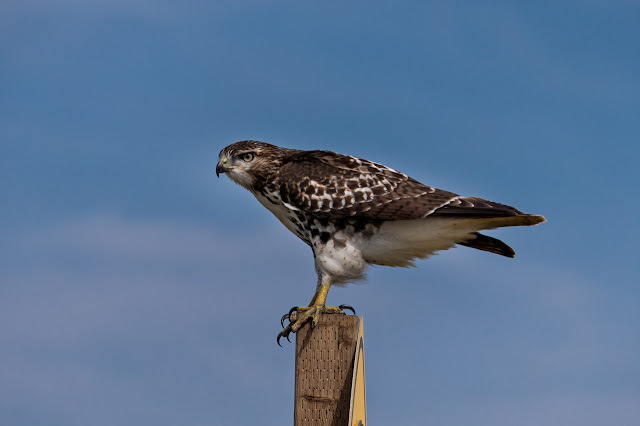 But a hawk will sit on a post beside the highway. I love your first hawk shot the best, the colors are so intense and beautiful! And what a great capture of the yellow color of the Oriole! Great hummer too! All are beautiful, Ruth; but the hawk steals the show! You KNOW I love birds! This was special!! Wonderful captures of all these pretty birds. I love the little ones. Love our fine-feathered friends. We see all sorts of 'other' birds come through when they are migrating south. Your Oriole is beautiful. We don't get those here. Wonderful shots! Chickadees are my favorite bird and the hawk shots are great. All pictures of the birds are fabulous. I especially like the hawk. God's Nature is so beautiful and you alwaays capture it so well Ruth. Sorry I cannot comments as muct as I used to although I do see you posts but my brother has had a very bad stroke and it is taking a lot of my time now. I too love birds. 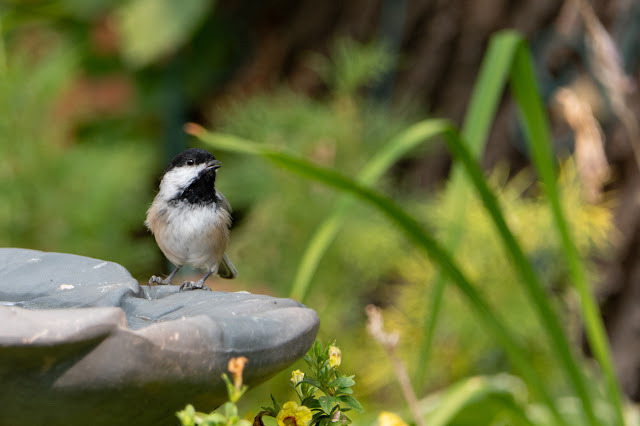 Regular visitors are the chickadees who are quite friendly. 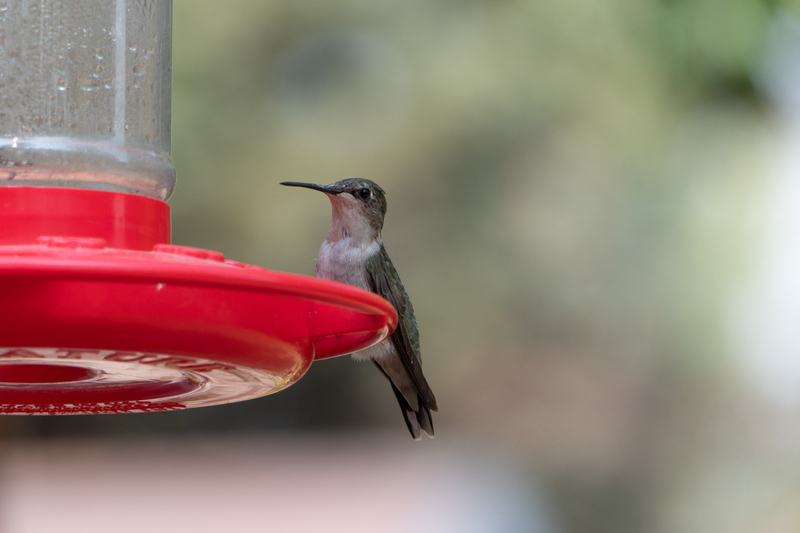 The hummers are also a favourite. I hope they don't get caught up in the storms down south. Our birds are so different from yours. That makes is more beautiful. Love the yellow bird. beautiful birds, the hawk especially!! a beautiful and truthful closing thought!!! I hope I will be able to get good shots like that soon. Wow - all the bird photos are amazing, Ruth. I love the Oriole.